Another year, another kaizen adventure. Well, not just one adventure – a whole host of adventures and FYI – I am referring to changes as adventures. Because that’s what they are, right? You make a change, you hold your breath and pray to adventure Gods that good things will happen. So therefore, to say that 2015 was a year of kaizen adventures is an understatement. Learning Rebels has one vision: To help people be the best version of themselves. To achieve this, the single focus is to “Lift Learning in the Workplace”. And let me tell you there was a lot of lifting happening in 2015. Remember the 3 C’s of being a Learning Rebel? Curiosity , Courage of Convection, Challenge the Status Quo? Always up on the kaizen parade is shifting bias. When conducting my own research and when talking to others in my network (and those not in my network), I try to challenge my own bias. This is where I find my thoughts expand. Maybe this is a reflection of age, or perhaps years of experience but I find opinions I start with, rarely are in their original form once I have hashed out those thoughts on paper and to those around me. No, I’m not saying to go all wishy-washy and not have solid opinions or convictions. Kaizen in the Learning Rebel world includes making small tweaks in the information you are holding as near and dear to your heart, and sometimes blowing up the unconscious bias we may have around certain topics. I personally do not believe there is room for absolutes in the Education/Learning/Training Industry. This was my message to people I worked with this year. Positive deviance is a good thing, change is a good thing, and questioning status quo is a very good thing. Take a little kaizen to the information you “think” you know. Give it a twist, allow for different perspectives therefore continuing to grow and formulate your own opinions. Do not let others do your thinking for you, BE INSANELY CURIOUS. I have built an entire career on one question – Is there a better way to…? Ask this question with all you do, listen to your heart and mind, and you will be rewarded. Is there a better way to explain this theory? Can this theory/matrix/taxonomy/methodology be better presented to reflect current times? Is there a better way to present this information? Is there a better way to share, research, find, develop? Is there a better and more accessible way to get knowledge to people when they need to have to it? Note, I did not say easier. I said better. Sometimes better is not easier, and a lot of times easier is not better. It’s just easy. Sometimes we get lucky and it’s both easy and better. The Kaizen jackpot. I did say there were some kaizen adventures in the Learning Rebel world. Let me expand a bit. Learning Rebels took many adventures in 2015 here are the top 5. Learning Rebels did less consulting this year. This was a purposeful shift. Remember that vision statement: To help people be the best version of themselves? My goal of reaching out to other learning professionals and helping them (and their teams) to take their personal and professional growth to the next level was not found in some of my consulting projects. I wanted to develop more webinars, workshops and provide more content that is meaningful. Therefore, I used a bit of kaizen to shift the “ideal” Learning Rebels projects and customers. While I cannot say this shift instantly made me independently wealthy, I do feel better about the work I’m providing. HUGE. Speaking of newsletters. I am most excited about #RebelliousReaders. We have taken kaizen to the book club approach. Our first book is appropriately…”Working Out Loud” by John Stepper. I didn’t decide on this book, nor did a group of twitter handles. We are an inclusive group – and the group voted. The goal of #RebelliousReaders is to take action through reading and sharing. It’s never too late to join. Don’t be a “cobblers child”, take a step and sign up. More speaking engagements. I like getting out there and finding you. Listening, learning, exchanging ideas face to face. I made the rounds in 2015 and participated in a number of free webinars. This year I’m scheduled for five conferences (Schedule to be posted) and I hope I get to meet more Rebels and hear about what you are doing to lift learning in YOUR workplace. I’m hoping to capture these conversations and share them here. There is no group too small for me. I would love to meet face to face with your team and have a learning exchange! A world beyond L&D. This year many of my conversations have been with content marketers and social marketing people. These people can tell us a thing or two about developing content that sticks. As an industry, we are woefully behind the technology and content development eight ball. Content marketers are eating us up for lunch with the ease and simplicity surrounding content development. They have a full knowledge of their audience, the content they want, and how they want that content delivered. They then make that content extremely easy to find and access. I have tuned into these conversations and have learned A LOT. I hope you are finding new places to find information too. All and all the goal of this is to make Learning Rebels a more valuable tool for you. Turning Learning Rebels from a blog platform to an actual business may have been a necessity of the times and a tough hiring market in the Chicagoland area. But let me tell you, over the past two years of being in business, you have helped me as much as I hope I have helped you. To keep curiosity upfront and personal here is a custom Learning Rebel wallpaper for your computer screen. Let it always remind you to stay curious! Let’s continue to make shifts and to put kaizen to work. Here’s wishing you spectacular success in 2016. Looking for something to read in 2016? Don’t wait any longer, add Disruptive Learning to reading list! Don’t miss another issue! 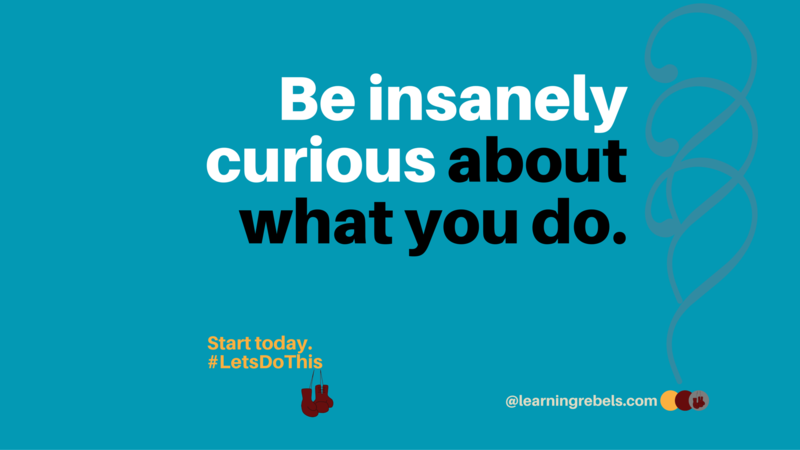 Sign up for the Learning Rebels Newsletter. Remember – Rebellion, It’s Good For You!